In an earlier post, we saw how archaeologists have gradually unraveled the history of the domestication of Mexico’s most important food plants. Other archaeologists, working at Teotihuacan, close to Mexico City, have been turning their attention away from how the upper classes lived (and ruled) to focus on the lives of the ordinary residents of suburbia fifteen hundred years ago. 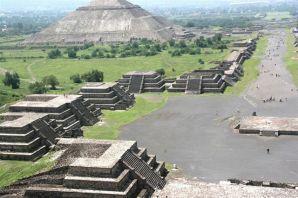 At its height (500 AD), Teotihuacan was one of the largest cities in the world, with an estimated population of 200,000. Its elaborate water supply and drainage systems and a precisely aligned grid demonstrate masterful urban planning. The city was so prominent that it became a magnet for craftsmen from other far-away regions like Oaxaca and the Gulf Coast (Veracruz). These migrants would have brought their own food ideas and preferences with them, making Teotihuacan an excellent choice for a cosmopolitan eating experience. What most visitors to this ancient city today do not appreciate is how the average Teotihuacanos lived, how they cooked, and what they ate. But, between 1985 and 1988, cleverly conceived and executed fieldwork by a team directed by Linda Manzanilla of the National University (UNAM), unearthed a wealth of information about ancient food storage, preparation methods and kitchens. Manzanilla has demonstrated that age-old kitchens in Teotihuacan can be located by a combination of traditional archaeological methods (collecting artifacts, debris, pollen and food remains) alongside the microscopic and chemical analysis of the stucco floors in the multi-room apartment complexes used as residences and workshops. It was already known that the stucco used on floors can absorb, over time, trace amounts of chemicals that serve as indicators of the predominant activities carried out in the room. Soil samples were taken from each square meter of floor and then analyzed for certain key indicators. High levels of phosphates revealed areas where organic refuse was abundant. This could be a place where food was consumed, or where refuse was discarded. An elevated level of carbonates was assumed to reflect either a place where stucco was processed, or somewhere where tortillas were prepared. The tortilla-making process today still involves the liberal application of lime. A localized higher alkaline reading from the stucco floor was correlated to the location of heat or fire. The color of the soil samples was also checked for any indication of the limits of a particular activity. Once an outline of the distribution of particular activities had been sketched out, the presence of sodium and iron was investigated. High levels of iron, for example, probably indicate where agave was processed, or where animals were butchered. The end result? By correlating the various lines of evidence from this particular sixth century apartment, Manzanilla was able to pinpoint the precise locations of many everyday household functions. For instance, three areas where ceramic stoves once stood were distinguished. Each had a dark red stain on the floor, with relatively low carbonate values, relatively high alkalinity, and some ash. Significantly higher phosphate values in a band around this zone suggested an area used for eating. Higher phosphate levels were also encountered outside the dwelling where any refuse had been swept or accumulated. And what was cooked on these stoves? We can not be certain, but evidence suggests that the residents of Teotihuacan had a varied diet of plants and animals. They not only prepared corn, beans, squash and chiles, but also ate cacti (prickly pear), hawthorns and cherries. For additional protein, rabbits, deer, duck, dogs, turkeys and fish were all on the menu, at least occasionally. And, lest you think their likely diet sounds too bland, the locals also had access to potatoes and a plethora of herbs and spices, as well as chocolate, chewing gum and tobacco to satisfy their cravings, and various exotic hallucinogens to stimulate their imaginations! Manzanilla, Linda (1996) Soil analyses to identify ancient human activities. Canadian Journal of Soil Science.